In ancient times humans studied the night sky and discovered the worlds of Mercury, Venus, Mars, Jupiter and Saturn. But beyond this realm of knowledge, another world shined brightly just waiting to be discovered. Uranus is the seventh planet from the Sun, from a distance of about 20 astronomical units or 20 times the distance between Earth and the Sun. Uranus orbits the star once every 84 earth years approximately the length of a human's entire life. This orbit causes each season of Uranus to last that much longer, theoretically, a human living on Uranus would experience the four seasons only once but each for about 21 years. Partially due to its distance from the Sun, Uranus boasts the coldest temperatures in the solar system. These icy temperatures dropping as low as negative 370 degrees Fahrenheit are largely influenced by the planet's composition. At about 4 Earth's wide Uranus has an Earth-sized core made of iron and magnesium silicate. 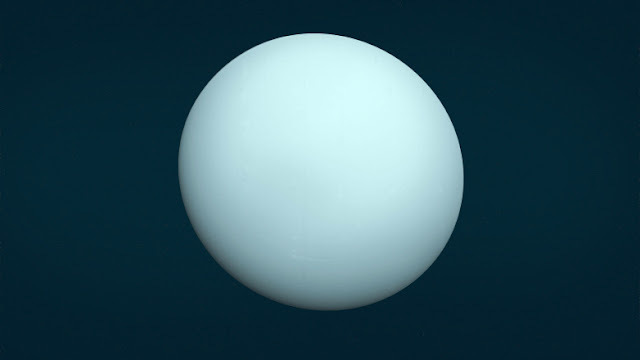 The remainder approximately 80% of Uranus is a worldwide ocean of ices made of water, ammonia and methane the chemical behind the planets cooled blue colour. This icy composition prevents Uranus from emitting much heat compared to other planets making the blue world the solar system's coldest. In addition to its extreme temperatures at orbit, Uranus has a dramatic orientation. While the other seven planets spin on their axes like tops Uranus appears to roll along its equator. The planet is tilted at a near right angle in which polar regions point toward and away from the Sun rather than upward and downward. This tilt thought to be the result of Uranus's collision with at least one celestial body. It has also affected the orientation of Uranus's thirteen rings and 27 known moons. Unlike the rings and moons of other worlds which orbit their home planets horizontally those of Uranus orbit in a vertical orientation along the planets tilted equator much like a Ferris wheel. Uranus and its many unusual features were a mystery to the ancients and the planet was actually thought to be a star. But in the late 18th-century astronomer William Herschel discovered that the celestial object was actually a new world. The scientific community debated over what the planet should be called and eventually chose a name suggested by astronomer Johann Elert Bode. Bode believed that since Jupiter was the father of the gods and Saturn was the father of Jupiter then this new planet should be the father of Saturn Caelus. But rather than following the tradition of using names from ancient Roman religion Bode instead opted for Caelus ancient Greek equivalent Ouranos. Ouranos the ancient Greek god of the heavens was then latinized to be Uranus. To this day Uranus is still the only planet that veered from tradition with an ancient Greek namesake a status most fitting for a planet beyond convention. Also Read:- How Did The Voyager Navigate In Space?